Broadbeach has beautiful surf beaches, parks and markets and is one of the Gold Coast’s dining precincts and also home to Jupiter’s Casino. The Gold Coast Convention Centre is located here, hosting international and Australian conferences. The newly refurbished Pacific Fair Shopping Centre is also certainly a draw card for locals and tourists. 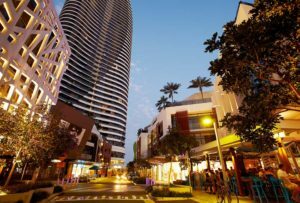 Broadbeach is a mix of high-rise apartment living, waterfront & beachfront properties as well as older style and new homes and home on canals. View the reviews and comments from our other customers who have purchased properties in Broadbeach & Broadbeach Waters and engaged us to undertake their pre-purchase building and pest inspections for them! Thank you for doing our inspections for us, Mum was very impressed and said that she would certainly use Allied Home Inspections again in the future. Thank you Peter for all the information you gave to me, it was really appreciated. Thanks to you I am confident to go ahead with this purchase.